“We wanted our wedding day to be uncomplicated, relaxed and to reflect us, and with a little help from our friends it was perfect” Began Sarah. “We had a tiny budget. We found an art gallery in-between shows that was a blank canvas for us to decorate ourselves. We knew we could make the venue really pretty just by adding a few floral arrangements for impact against the white walls and concrete floor. 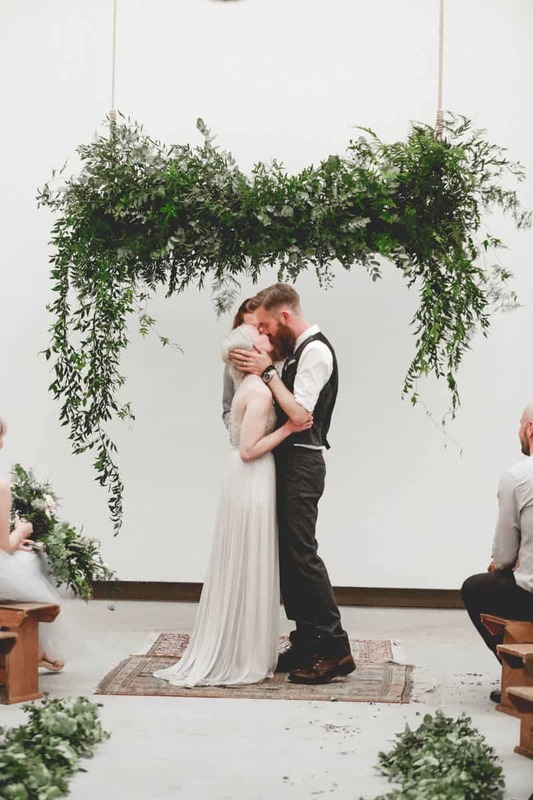 And although logistically awkward, the wild hanging fern swing looked stunning- as did the hand tied bouquets- full of eucalyptus, asparagus fern, sweet Juliet roses, thistles and succulents” Sarah described. “We asked our guests to bring their own bottle of wine (or 3), we browsed flea markets for rugs and decor, we picked hydrangeas from neighbors and friends gardens to dry out and hang off festoons. We had bread from the bakery I work at and packed wooden boxes with cheese, cold meats and salads for a non fussy, delicious sit down picnic. Whilst the evening ended with a whisky” She added. Amazing wedding, great photos. So nicely captured. love this! that ceremony setting is incredible! What an absolutely beautiful wedding to have captured and such an incredible love story! Looks like a truly beautiful day to have captured, and done so well by the photographers. Photo booths are also a great idea to capture the guests and bridal party interacting on the day – a fantastic way to see genuine, special moments. Holy cow – what a beautiful day! Loved reading about the couple and their day. The hanging florals, the emotions that were captured – stunning. Congrats to the couple! Stunning pictures. Love that’s decorations. Beautiful space, beautiful people, beautiful photos!